Developed by Joe Gibbs, this conventional 10W-40 is an advanced petroleum motor oil that has been formulated to provide maximum protection and performance in classic V8 engines and vintage vehicles. This race proven oil technology includes the correct amount of ZDDP to ensure your engine has critical anti-wear protection. 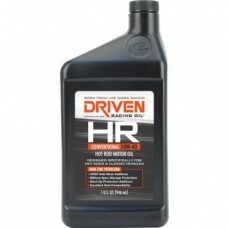 HR oil also incorporates rust and corrosion inhibitors to provide unmatched engine protection during storage periods. This conventional oil is well suited to a variety of classic hot rods and muscle cars and is appropriate to use in any engine that calls for a 10W-40 grade motor oil. Features storage protection additives that guard against rust and corrosion during winter storage. This oil does not require further ZDDP or additives.